The Center for Ocean Observing Leadership is located within the Department of Marine and Coastal Sciences Building on the Cook Campus of Rutgers University New Brunswick Campus. Traveling north on Rt. 1 you will go under an overpass which is Rt. 130, continue north on Rt. 1 until you see signs for Rutgers – Squib Drive/College Farm Road. Exit to your right which will be a sharp right turn which will lead you back under Rt. 1 and you will continue until you come to a stop sign. Make a left onto College Farm Road at the stop sign. You will continue until you come to a stop sign at a four-way intersection. You will see the Marine and Coastal Sciences building across the street to your left. The parking lot for you to park in is on your left – LOT 98a. 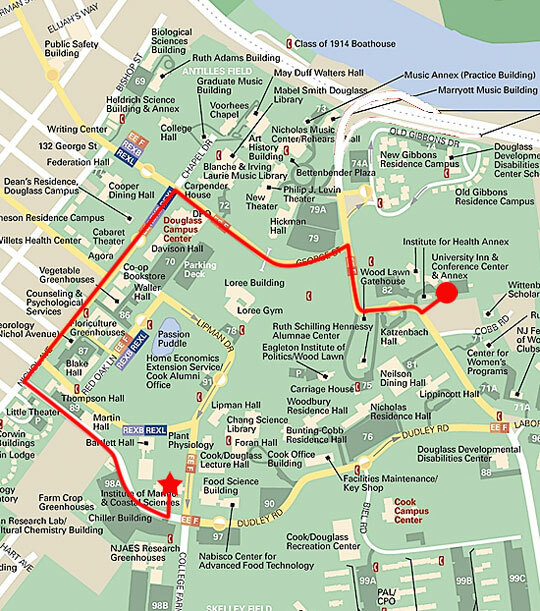 If you will only be staying a short time, park at the meters, otherwise find a non-metered spot and you will have to get a parking pass from the main office in Room 104 which is through the main entrance of the building (big glass doors) and through the first set of double doors you will come to. Room 104 is directly ahead of you. Turn off at Exit 9. After toll booths bear to the right; follow signs for “Route 18 North – New Brunswick.” Proceed along Route 18 North and take the exit marked “Route 1 South – Trenton”. Proceed along Route 1 South, then take the exit marked “College Farm Road.” Bear to the right towards yield sign, then turn right and continue along College Farm Road into the Cook Campus. Proceed straight on College Farm Road until reach stop sign at a four-way intersection. The Marine Sciences building will be across the street to your left. The parking lot for you to park in is on your left – LOT 98a. If you will only be staying a short time, park at the meters, otherwise find a non-metered spot and you will have to get a parking pass from the main office in Room 104 which is through the main entrance of the building (big glass doors) and through the first set of double doors you will come to. Room 104 is directly ahead of you. Go to Exit 1, and get on Route 1 south. Go down Route 1 South until you get to the College Farm Road exit (1 mile past route 18). Make a right on College farm road and go to the first stop sign (about 1 mile) . The Marine Sciences building will be across the street to your left. The parking lot for you to park in is on your left – LOT 98a. If you will only be staying a short time, park at the meters, otherwise find a non-metered spot and you will have to get a parking pass from the main office in Room 104 which is through the main entrance of the building (big glass doors) and through the first set of double doors you will come to. Room 104 is directly ahead of you. Coming from Southern New Jersey (Heading Northbound) – Turn off at Exit 105 and follow signs for Route 18 North. After approximately 24 miles you will pass the entrance for the New Jersey Turnpike, then continue on Route 18 North (see NJ Turnpike directions above). There is a train stop in downtown New Brunswick which is on the Northeast Corridor line. You can take the New Jersey Transit train from Newark Airport to New Brunswick for $12.00 (an adult one-way ticket) and then can catch a cab to Cook Campus where the Institute of Marine & Coastal Sciences is located. A cab will cost maybe $10 and is about a 5 minute ride. If you are taking an Amtrak train to the institute, the train only stops in a few places. The closest stop if coming from the North is Metro Park which is in Edison. It is then a 15 minute car ride to Rutgers or you can jump on the New Jersey Transit train which will take you to the New Brunswick Train Stop which costs only $2.00 one way. If you are coming from the south on Amtrak, then you would stop at Princeton Junction train station and then jump on the New Jersey Transit trains to New Brunswick which would cost $4.00 one way. Turn right out of the University Inn onto Ryders Lane. You will have to make a right and do the jughandle to turn around and then make a right onto George Street. Turn left onto Nichol Avenue. Turn left onto Dudley Road (you will see signs for Cook Campus). The Marine & Coastal Sciences building is on your left – park in lot 98A on your right. You MUST get a parking pass for your vehicle or you will be ticketed. To get a pass, go through the main entrance of the building (large glass doors) and go through the first set of double-doors you come to. Go straight ahead into Room 103 and they will provide you with a parking pass. Will will have to get a new pass each day you are visiting the institute.